Metal Detecting In New Mexico? Metal detecting in New Mexico follows the ARPA (Archeological Resources Preservation Act). Pay attention to this page and the others I link to. This information can keep you out of jail. The link below will give you a better understanding of ARPA, and some of the problems people face who break this law. Be sure and read through the entire page at the link above. In addition to the above mentioned ARPA law, if you are metal detecting in New Mexico, you must be aware of another law, the NAGPRA - Native American Graves Protection And Repatriation Act. Of course reading through all of this information can be tedious, but you need to understand the law. It could save you the grief from being arrested and thrown in jail. Now, to add even more redundant information, redundant because our elected officials have passed similar laws under different names formulated by State Archaeologists who want to make sure that our hobby is kept in check. Now here is another law to pay attention to. As confusing as the above laws may seem, if you are detecting in New Mexico, do not dig anything that you believe is an artifact, or anything that is older than 100 years. For detecting in New Mexico, town, village and city parks, you'll need to check with those local officials. 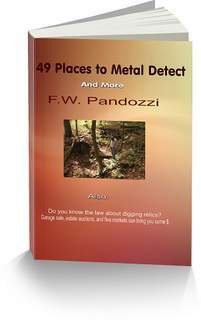 Some have decided to give up the hobby of metal detecting because they feel strangled by the laws. If you are feeling the same way, you are making a mistake. By giving in to the beauracrats who make these insidious laws you give them the power to do more, and in the end, they win. There are so many areas of private property that are potentially great detecting sites, and that are unaffected by these laws, all you need to do is ask for permission. Have you tried metal detecting in New Mexico ghost towns? Remember, pay attention to the laws. And do not give up.